Purpose: To compare invasive and non-invasive techniques for measuring tear break-up time (TBUT) in contact lens users. 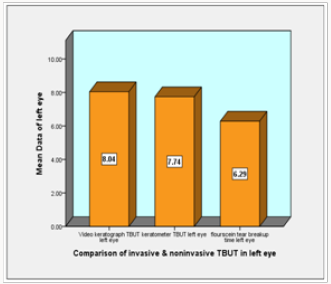 Methodology: Comparison of invasive and non-invasive TBUT was done on a sample of 30 contact lens users (60eyes) ages limit from 15 to 30 years of females at Department of Ophthalmology, Madinah Teaching Hospital (MTH) Faisalabad by applying non probability convenient sampling technique. This descriptive cross sectional study was completed in duration of 6 months from October 2018 to March; 2018. An appropriate informed consent was taken from each participant under study. Video keratograph and Bausch and Lomb keratometer were used to measure non-invasive tear break up time. Flourescein tear break up time was performed by Slit Lamp using flourscein strip. Averages of three readings were recorded of each technique to ensure accuracy. Data was analyzed by One-way ANOVA test in SPSS software version 20. Results: There is insignificant difference between invasive and non-invasive TBUT technique at level of 5% confidence interval. Conclusion: There is no significant difference between values of invasive and non invasive tear break up time. Each of three techniques can be applied for measuring tear film stability. Tear film is transparent liquiform coating that overlies cornea and conjunctiva. It has a trilaminar arrangement with an outlying lipid, an intermediary aqueous and the inner most mucous layer. Cornea is transparent optical refracting medium that lies immediately beneath tear film. Tear film spreads over corneal epithelium with each blink. Tear film and cornea are in mutual relationship confirming each other’s integrity. A healthy tear film significantly contributes to provide regular, smooth optical interface by filling corneal surface irregularities. A vascular cornea mainly counts on tear film for nutrition. Tear film absorbs environmental oxygen supplying it to cornea. Moreover, vital nutrient glucose seeps into the tear film through palpebral conjunctival vessels, from where it is supplied to cornea . A stable tear film is representative of consistency and integrity of tear film. Assessment of tear film stability provides information about dynamic behavior of tear film. Tear film destabilizes in a specific time period following a blink. Early destabilization of tear film is indicative of tear film instability which can result in dry eye . Many factors affect tear film stability including senile changes, ocular conditions like blephritis, meibomian gland dysfunction or any primary ocular surface disorder, hormonal changes, drugs like contraceptives, anticholinergic, antidepressants, antipsychotics, vitamin A deficiency, environmental changes and use of contact lenses . Stable tear-film is fundamental necessity for successful contact lens usage. CL splits tear film in pre-lens and post lens segments affecting its biochemical and biophysical properties. Contact lens placement mainly interrupts lipid layer of tear film, rendering a thinner lipid phase pre-lens segment of tear film due to which evaporation occurs earlier irrespective of contact lens material  Tear BUT mechanism with contact lens is different as compared to tear-breakup time mechanism of tear film without contact lens. Contact lens mainly disorganize lipid layer as polar components of lipid layer show more affinity towards contact lens surface. Thinning of lipid layer increases evaporation rate which leads to tear film instability . Furthermore increased phospholipase level has been reported in contact lens user’s tear film. It causes oxidation and degradation of phospholipids which in turn leads to lysophospholipids and diacylglycerides production. These are highly unsaturated and unstable. Hence earlier disruption of lipid layer occurs, reducing tear film stability . Thus tear film stability measurement signifies its role as an imperative investigation procedure especially in contact lens users. A description cross-sectional study with sample of 60 eyes of 30 females’ subjects was conducted at Department of Ophthalmology, Madinah Teaching Hospital (MTH) Faisalabad in months of October 2018 to March 2018. Female contact lens users, belonging to age group from 15 to 30 years were recruited through non probability convenient sampling technique. Any subject with corneal or conjunctival disease, traumatic or drug and surgical history were excluded. Pregnant ladies and with astigmatism higher than ±0.75D were also excluded. After taking consent and complete history of ocular and systemic diseases, surgery and contact lens use the following procedure was applied in succeeding order on all subjects (Figures 1 & 2). Non-invasive TBUT measured through video keratograph, Galile 4 (ziemer). In this technique mires was projected on ocular surface &focused clearly. Subject was asked after one complete blink to stop blinking. Examiner observes mires and elapsing seconds were counted until mires become distorted or diffused. Procedure was repeated and average of three readings was recorded as non-invasive tear breakup time (NITBUT) by video keratograph. Non-invasive tear breakup time was also measured using manual Bausch & Lomb keratometer (Topcon OM-4). Circular mires were focused clearly and subject was asked to stop blink after one complete blink. Mires were observed and time was recorded in seconds using stopwatch until distortion. Procedure was repeated thrice and an average was recorded as non-invasive Tear breakup time by keratometer. Standard invasive method for tear breakup time measurement was performed at last because instillation of fluorecein may affect the values of NITBUT. Fluorescein strip was gently touched in upper conjunctiva to stain tear film. This stained tear was recognized through slit lamp, using cobalt filter and wide beam under low magnification (6X-10X). Post-blink time taken for the first black spot appear in green dyed tear film was considered. Three recordings were taken and an average considered as invasive fluorescein tear breakup time (FTBUT). The measurements obtained binocularly from each subject were expressed as mean standard deviation. The analysis was done by entering whole data into the software of SPSS version 20 by ANOVA test. 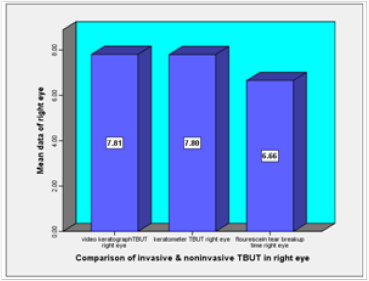 Comparison of an invasive fluorescein tear break up time (FTBUT) technique to two non invasive tear breakup time (NITBUT) techniques was performed on 60 eyes of 30 female contact lens users of age 15-30 years. Mean value of video keratograph tear break up time (VK TBUT) of right eye is 7.807±2.965 sec, mean value of keratometer tear break up time (KM TBUT) of right eye is 7.797±2.981 sec and mean value of flourescein tear break up time (FTBUT) of right eye is 6.656±1.675 sec, which is less as compared to non-invasive TBUT values. Mean value of video keratograph tear break up time (VK TBUT) of left eye is 8.042±3.454 sec, mean value of keratometer tear break up time (KM TBUT) of left eye is 7.744±2.847 sec and mean value of flourescein tear break up time (FTBUT) of left eye is 6.285±2.057 sec and is less as compared to non-invasive TBUT values. Comparison of mean values of tear break up time (TBUT) obtained by applying ANOVA analysis, shows that significance value for right eye data is 0.164 and for left eye data is 0.297 which is greater than 0.05 and therefore, there is no statistically significant difference between mean values of all the three techniques. Purpose of conducting this study was to compare invasive and non-invasive techniques to measure TBUT among contact lens users as contact lens strongly alter tear film and its components. Results showed there is no such significant difference between either. A study by Jeong et al. on two groups one with eye dry subjects other was control group was organized to see the difference between keratograph and flourescein tear break up time. Similar to our study, they stated that there is no difference between invasive and non-invasive tear break up time (r=0.66, p<0.001) and (r=0.77, p<0.001). Hong et al. conducted a prospective study on 44 patients of dry eye and 41 normal subjects and performed one non-invasive technique and flourescein strips, schirmer 1 and inferior tear meniscus height as invasive technique. Results depicted there is significant difference between non-invasive tear break up time and invasive tear break up time. Contrary to this, present study disagreed as there is no significant difference. They use different methods for invasive tear break up time and their study was on two groups one with dry eye and one group was healthy. Johnson and Murphy published a study in which there was no difference between two methods for instillation of flourescein by micropipette and flourescein strips. They conclude that flourecein volume affects the tear film dynamics . Likewise in our study we only used the flouresein strips with same concentration to avoid the effect of flouresein volume. On the other hand, a study performed on two separate groups i.e. group 1 (control) and group 2(dry eye) showed there is significant difference between invasive and non-invasive procedures. Corneal topographer as non-invasive and break up time and schirmer 1 test used as invasive tear break up time. The non-invasive tear break up time was lower than invasive tear break up time in both groups and concluded that non-invasive is good method for diagnosis of dry eye [9,10]. While our study was performed on same group of contact lens users and flourescein strips with slit lamp as invasive method. The research revealed that values of invasive tear break up time and non-invasive tear break up time measured through video keratograph and Bausch and Lomb keratometer, have no significant difference in contact lens users. Each of the three techniques can be applied for measuring tear film stability. It is concluded that noninvasive techniques are theoretically and practically more sound for assessment of tear film stability in cases where fluorescein is contraindicated i-e pregnant women, asthmatic patients, history of allergies etc. Non- invasive techniques should be procedure of choice for investigating tear break up time in soft contact lens users to avoid deposits and staining of soft contact lens. Amaechi OU, Osunwoke CM (2004) The relation between invasive and non invasive tear breakup time in young adults. Nigerian Optometric Association 11(1): 29-31. Lee JS, Salapatek A, Patel P, Soong F (2009) Comparasion of Non-invasive tear break up Times (NIBUT) Assessed with Video-Corneal Topography to the Standard Invasive TBUT as Studied in Patients After Exposure to Low Humidity Environment (LHE). Invest Ophthal & Vis Sci 50(13): 5-25. Willcox MP (2007) TFOS DEWS II Tear Film Report. The Ocular Surface 15(1): 366-403. Pult H, Nichols JJ (2013) Contact Lens related dry eye disease. Geoff Greenwood 77-87. Ayers BD (2003) The Wills Eye Manual office and Emergency Room Diagnosis and Treatment of Eye Disease, (7th edn. ), : Wolters Kluwer, China pp. 52-103. Jeong S, Lee SB (2016) Reliability of a New Non-invasive Tear Film Breakup Time Measurement UsingaKeratograph.The Koreanophthalmology society 57(9): 1354-1360. Hong J, Sun X, Wei A, Cui X, Li Y, et al. (2013) Assessment of tear film stability in dry eye with a newly developed keratograph. Cornea 32(5): 716 -721. Johnson ME, Murphy PJ (2005) The effect of instilled fluorescein solution volume on the values and repeatability of TBUT measurements. Cornea 24(7): 811-817. Bhandari V, Reddy JK, Relekar K, Ingawale A, Shah N (2016) Non-invasive assessment of tear film stability with a novel corneal topographer in Indian subjects. Int ophthalmol 36(6): 781-790. Craig J (2002) Structure and function of the preocular tear film. The Tear Film Structure Function and Clinical Examination, (1st edn. ), Butterworth Heinemann, United Kingdom, USA 18-50.